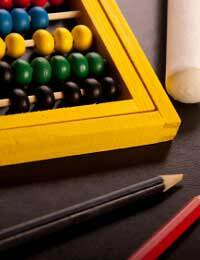 An abacus is a great way to teach children about Maths and also a fun project to make. They’re easy enough to make and play with at home and cheap enough that teachers can make them as a project with their whole class. This abacus should only take around one hour to make. Here we address the basic abacus; Japanese or Chinese abacuses are more complicated and have their own counting systems. These abacuses are suitable for more advanced maths teaching. This simple abacus is a great way to get children thinking about adding, subtraction and multiplication. 1.Take two of your wooden lolly sticks, a pencil and a ruler. 2. On two of your wooden or lolly sticks, make 10 pencil marks down the length, each of equal distance apart. 3. Put a thin line of glue along each of the pencil marks on one side of the abacus only. 4. Carefully stick a skewer on each glued pencil point on one side. Press down and allow to dry fully. 5. Carefully, tip the abacus on its side and slide ten beads onto each skewer, five of one colour and five of another. 6. Repeat steps three and four on the other side of the abacus and allow to dry thoroughly. 7. Take the remaining two lolly sticks or pieces of wood and glue them over the skewers. You should now be able to slide the beads along easily. 8. if the beads are cathcing glue some additional lolly sticks or wood on the underside to raise the abacus up. 9. Once the glue is dry, your abacus is ready to use. Most of the materials used to make an abacus here are safe. However, children should still be supervised. Allowing the children to make their own abacus (although they might need some help) can engage them with the subject as they are more likely to be proud of and want to use something they made themselves. Using five beads of one colour and five of another on each row helps children to see numbers easily by eye. (They can see, for example, that 5+2 = 7 without having to count). You can also use the abacus to do simple multiplications, for example 4x5 or 9x6, just by separating off the beads of each row. You could also use cardboard instead of lolly sticks and pipe cleaners instead of skewers. If you're making them as a class, don't forget to ask the children to put their name on the abacus they have made. They can also decorate the lolly sticks if they want to individualise their abacus.